A four-second amateur video is ready-cut for the red carpet for one of the tensest plots: a man and a bear both turn the corner to bump into each other. A quick demonstration of sprinter skills follows - in opposite directions, however. 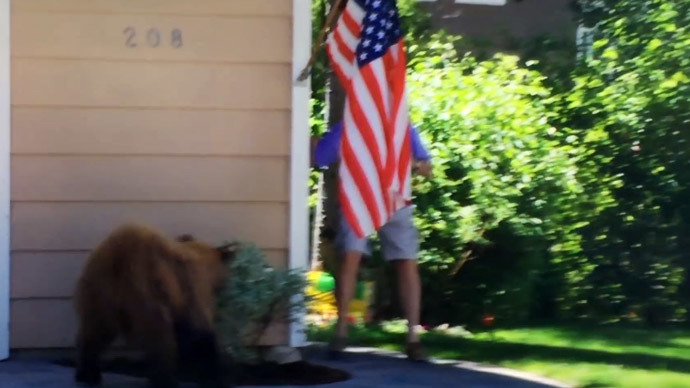 The video, which has already gathered over half a million hits, shows a small bear padding round the corner of a house in front of the garage when a man comes round the other side. Both are completely shocked to see each other and run back in the direction they came from. There is no explanation with the clip of where or when it was filmed, but media reports suggest it is a California neighborhood, while the bear, that looks like a juvenile black bear that has not yet grown its full black coat, appears to have been searching for a trash can. Just last week a group of tourists was filmed in Yellowstone National Park right after an unexpected encounter with a mother black bear and her three cubs. The tourists managed to run away. Though this is not the very best survival tactics, everyone went home happy ever after, including the bears.